A brown bear killed a hiker in Eagle River. A man searching for him was mauled. The body of Mike Soltis, an Eagle River man missing since Monday, was discovered in a brushy area close to the end of Hiland Road in Eagle River late Wednesday morning. A member of the search party looking for him was mauled by a brown bear close to where the man's body was discovered. The searcher, who was hospitalized with what police described as serious injuries to his leg, wasn't immediately identified. "It appears the brown bear was protecting the body (of Soltis) when it attacked a member of the search party," police wrote. The second man mauled was expected to survive, police wrote. 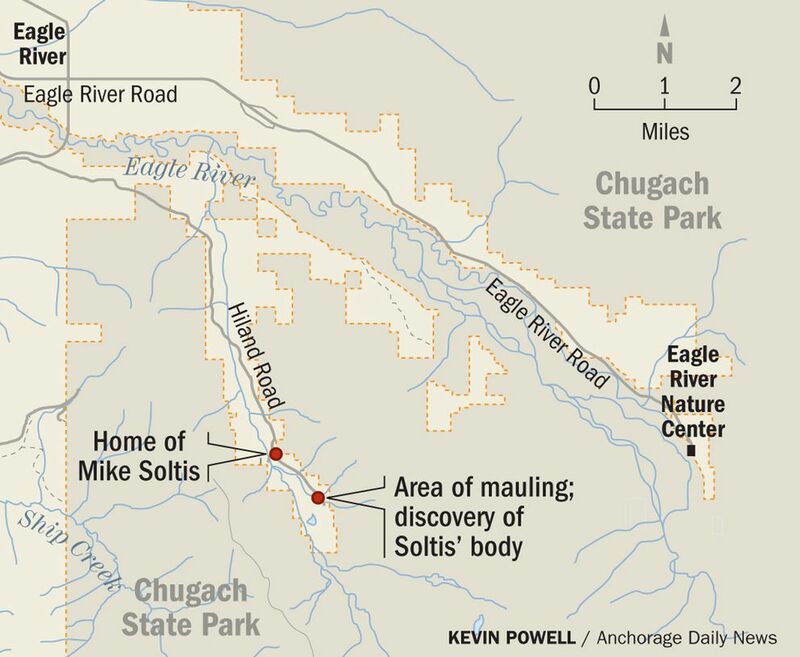 The South Fork Eagle River trailhead in Chugach State Park — on the other side of the valley — was still open as of 3 p.m., said Debbie Wuerch of the state Division of Parks and Outdoor Recreation. Rangers "are still in the process of assessing it," Wuerch said. Investigators were trying to determine the exact circumstances surrounding Soltis' death. Mike Soltis, the Eagle River hiker missing since Monday night, was killed by a bear, said MJ Thim of the Anchorage Police Department. Soltis' body was found in the same area — near where Hiland Road ends — that a brown bear attacked a member of a search party Wednesday morning. "It appears the brown bear was protecting the body when it attacked a member of the search party," APD said. The body was found a short distance from the road, Thim said. As of 1 p.m., officers were on the scene protecting the body for the medical examiner. Traffic was being blocked from passing the area. "The bear has not been located," APD said in a statement. "Police are still asking people to avoid the area due to the aggressive bear." A member of an informal search party looking for a man missing off Hiland Road in Eagle River was mauled by a bear Wednesday morning and rushed to a hospital, according to witnesses and police. The man, who wasn't immediately identified, suffered serious injuries to his leg and was expected to survive, according to police. It was a brown bear, police said. Police said the mauling victim was attacked "near the area at the dead end of Hiland Road." Family members and friends of Mike Soltis, a 44-year-old civil engineer, have been searching the Hiland Road area for the missing hiker since Tuesday. They had even hired a private helicopter. Soltis' cousin Wendi Yohman said she and two other volunteer searchers were checking a trail in the woods off Hiland when she heard a noise. The next thing she knew, a large brown bear was charging. "It was so fast," Yohman said, just yards from where the man was treated alongside the road. The man put himself between Yohman and the bear and was mauled. "I've never been so scared in my life," she said. The three searchers were able to scare the bear off, at which point they took the injured man to the road to seek help. A passing driver drove them back to near Soltis' home, where other volunteers applied a tourniquet to his injured leg. Police cars rushed to the scene, and searchers were trying to locate both the bear and the missing man. Biologists with the Alaska Department of Fish and Game had arrived on the scene as of about 11:30 p.m., spokesman Ken Marsh said. The bear's location was not immediately known, police said. "It's protecting something," a visibly shaken Yohman told reporters. "The bear is not acting normal."